Come help GLCCC teach RUSD 7th graders about our beach and water quality. Here, you will be teaching students different characteristics of our beaches. This includes general beach conditions (air temperature, wind speed, rainfall, weather conditions), water quality (water temperature, water color, water odor, turbidity), bather load (number of people interacting at the beach). At this station, you will be doing a number of water quality tests. A water quality test will include wearing a pair of waders and getting in the water with a student or two to conduct a turbidity test and to receive a sample of water for a dissolved oxygen test. This last station will be taking samples of water to conduct an E.Coli test which then the students will take back to school to analyze. 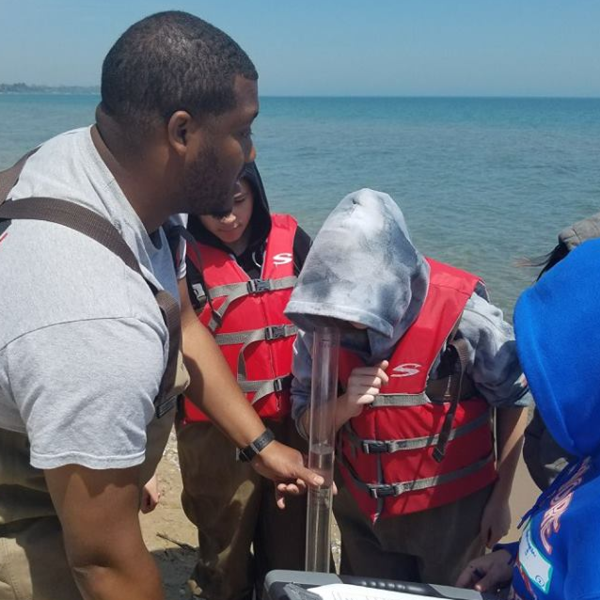 The goal is to keep younger generations aware of water quality and the effects it can have on the Great Lakes. We need 10 volunteers to help us teach, keep the flow of the groups, walk groups to stations and help with water samples. Since it is at the beach, come in shoes that are comfortable to wear in the sand and appropriate clothing. You may get wet, so keep that in mind. Between the two school groups we will have a lunch break, so pack a bag lunch. Lead 7th grade groups from one station to the next. Taking water samples to place on petrifilm for an E.Coli test. Conduct water quality tests. Get in a pair of waders with a few 7th graders and fill up a turbidity tube. Also teach them about dissolved oxygen.